This bag is a lean, mean, computer-carrying machine. MOTO-BAG: Is your laptop case being bullied by the other laptop cases on the playground? Then maybe it's time to update your wimpy case to the leather Wild Card Winged Heart Computer Bag at Five and Diamond in San Francisco. The straps adjust to form a messenger bag or a backpack, making it much easier to ride your motorcycle to the cybercafe. 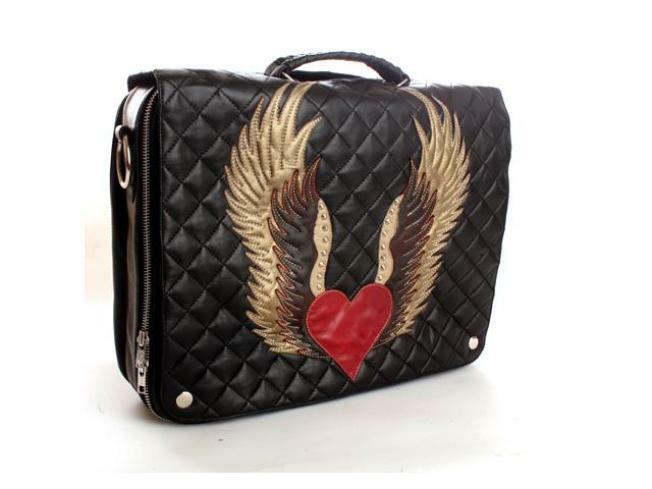 Wild Card Winged Heart Computer Bag, $530. LEGENDARY SALE: It's that time of year again: Barney's warehouse sale in San Francisco, where items go for 50-75% off! Get more info here. SAMPLE SALE:Saffron Rare Threads in the Castro is having a sample sale through Sunday. You'll find $99 suits and lots of stuff on the $50 and $20 racks. ADDITIONAL DISCOUNT: Shop at Retail Therapy Clothing Boutique in the Marina and Cow Hollow through Sunday and get an additional 50% off all sales items. If you spend over $100, you'll get your name entered in a raffle to win a $50 gift certificate. TEA FOR ME: We've been really into tea lately (trying to detox from all those cocktail parties), and we can't get enough of the goods at Aroma Tea Shop in the Inner Richmond. Be sure to check out the Red Apple Oolong.